I confess, I’m a Hop Head. It’s hard not to be a hop head here in Portland. As a matter of fact, Hali and I fell in love with Portland in 1990 and decided then to move to Beervana. Our infatuation with this town started at Bridgeport Brewing, the Granddaddy of all breweries. Sitting out on the loading dock with our dog, sipping their flagship IPA, being wooed by brewers and their tours, all lead up to our marriage to this “micro” city. Again, nearly impossible not to love a town that boasts of more microbreweries than any other. So, since my dog wouldn’t stand for pet chickens, I planted hops. Very low maintenance, hops grow from a tuber root, and mature with age(like my dog, Carlos). Just get a sunny southwest spot in the yard, and like Jack-in-the Beanstalk, watch it grow. In early summer you can actually see it grow inches in a day. All while sippin’ an IPA. So mid August rolls around and there are those lovely hop cones. Pluck them off at the height of ripeness-like right NOW! 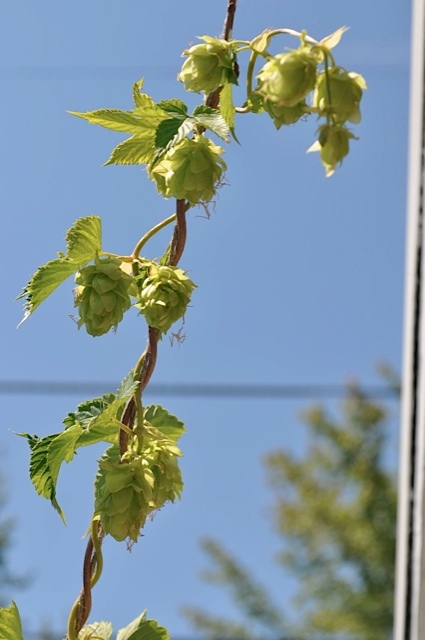 Find another local hop head, probably a neighbor, to collaborate with your very own brew. Come up with some catchy name like, Hop on Pope, and pretty soon you’ll be the talk of the town. Or at the very least, the talk of the block.